Maximum size: 40 mm (Kay, 1979). Natural history: Tenellia melanobrachia is a moderately common aeolid in Tubastraea coral habitat on the undersides of shaded overhangs or in caverns. It has also been found on the undersides of rocks. It lives in moderately protected to highly exposed areas from 2-43 m (6-140 ft). In Hawaii, it is known to feed on Tubastraea coccinea but it may also feed on other orange-pink Tubastraea spp. and dendrophyllid corals. In other parts of its range, it feeds on the green-black Tubastraea diaphana and the presence of a few dark brown animals suggests that it also feeds on that species in Hawaii (Scott Johnson). Tenellia melanobrachia is most easily found by looking for white Tubastraea coral skeletons from which the living tissue has been removed. 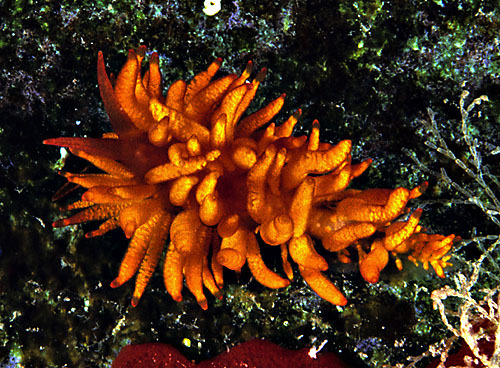 The nudibranchs are typically concealed in adjacent cracks during the day and are darker orange than the nearby coral polyps. They emerge at night to feed. The tips of the cerata contain cells that store a clear viscous liquid, presumably used in defense. Studies by Larry Harris (1968) showed that pigments in the coral tissue are taken up in the digestive gland, giving the nudibranch a coloration similar to its food. Since this species does not store nematocysts for defense, protective resemblance is important. It lays a white egg spiral that "flares" at the distal edge. This is one of the few nudibranchs for which life history data has been collected. Studies by Larry Harris (1975) showed a generation time of 60 days from egg to egg, and a lifespan of approximately 4.5-5.5 months. Distribution: Big Island, Maui, Oahu and Kauai: widely distributed in the Indo-Pacific: also in the eastern Pacific. Taxonomic notes: This species is listed as Phestilla melanobranchia in Hoover, 1998, Hoover 2006 and Kay, 1979. The name means "dark arms" because the original specimens had fed on green-black vs. orange corals. It's referred to as the "cup coral nudibranch" in Hoover, 1998 & 2006. It was first reported from Hawaii in Edmondson, 1946 (unnamed). Photo: Mike Severns: found by PF; Molokini; Jan. 15, 1989.